The firearm rides high and is presented at an optimum draw angle. 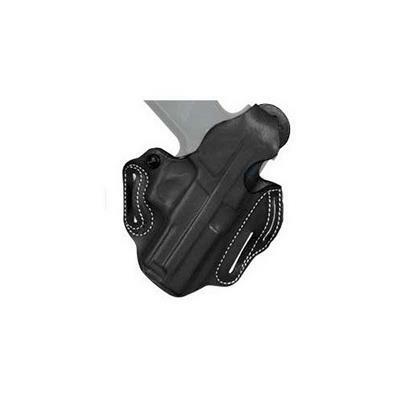 Its thumb break and exact molding, together with a tension device, allows for a secure and highly concealable carry. This picture illustrates the three-slot model. Belt slots are 1 3/4" wide. Available in black or tan leather, with or without suede lining, plain or basket-weave finish. Some models with two belt slots and without tension device.